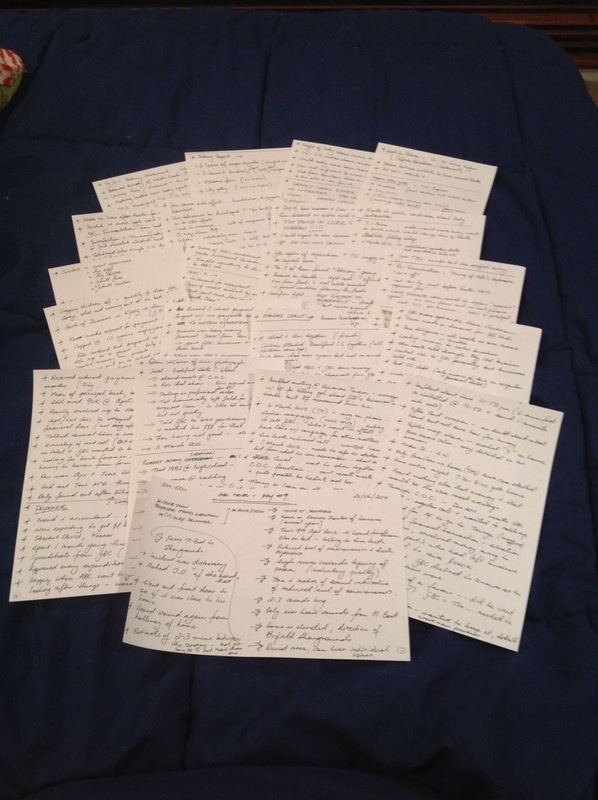 Just A Few Notes From Court Today…. This entry was posted in Australian Crimes, Crimes, Criminals, Fraud, Gerard Baden-Clay, Murders, true-crime, Uncategorized and tagged Allison Baden-Clay, aussiecriminals, Baden-Clay, Gerard Baden-Clay, Murder, Queensland, Toni McHugh by LJC2013. Bookmark the permalink. Bloody hell LJC…haven’t you heard about the problems with the de-forestation of the Amazon!! I’d like a fashion report as well. Any Haute Couture? Not unless you count EBC’s purple polyester puffer jacket that looks like a cross between Grimace and the Michelin Man. A purple polyester Puffer Jacket! Now there’s a man with confidence ! I think I’d team that with a nice pair of maroon flared cords and a snappy pair of velcro-close white running shoes….perhaps with orange socks. Are you sure he hasn’t been reading this site and he’s actually wearing a vest under it. A woman wearing it….that’s bizarre! Onesies….now there’s a crime ! I’m off to bed to dream of Purple Puffer Jackets. I’ll leave you in peace to get your work done otherwise Robbo may dock your pay. May your pencil remain sharp and your mind sharper. Love it, that would take me 3 days just to write all those notes and be able to read them. Go girl! And Robbo…the girl is so darn neat, it’s ridiculous!! Haha… Take 2 tomorrow, Gerry. You’re right about being exhausted after court. I’m only just through dealing with Flegg in the blog and I’m stuffed! Yep, which is why I’m not currently writing up a daily debrief, too draining. And the girls – are they having to go to school daily while all this is in the news? Or are they allowed to stay at home until it’s over? If at home, it means someone has to stay with them and keep them up to date with their school-work while their grandparents are at court each day. So hard for all concerned. And he sits there, being ferried back and forth each day. Meal ready when he returns to Arthur Gorrie and most probably someone responsible for ensuring his suit is cleaned and pressed, shoes polished, etc. What sort of person, if they know they’re guilty of murdering someone’s daughter, someone’s mother, someone’s sister, someone’s friend, could put people through all this? Why not be a man, if he’s guilty (and I believe he is) and pull his legal reps to the side to instruct them to change his plea to guilty and let everyone go home? Yeah BB – It must be exhausting for the Dickies – that grub gets everything still handed to him – just in protective custody! GRRRR Putting the family through this massive task – just by his plea of not guilty…..he (like his family) have to remain to be keeping up appearances! I don’t think that GBC chose to wind up in the dock. I’m pretty confident the Police had something to do with that. I feel your frustration BB… Believe me I do. The emotional impact of this trial is huge for all involved, as you say. But I suspect you know the answer to all the questions in your last paragraph and I share your rage and dismay for the same reason. He’ll go to his grave sticking to this story. We will never know what happened. I suspect he enjoys watching all this unfold, and causing pain and belittling loved ones. Even if it costs him his freedom. But rest assured, he believes he’s getting out of this. If she’d done to him what he did to her, it would be a certified case of justifiable homicide. He is no kind of man. Oh well, he’s put paid to The Legacy and broken his father’s ambitions into the bargain. When if either of them, or even the entire family of them had one iota of respect for that tattered, antiquated, valueless legacy, they’d at least make a show of living up to it, wouldn’t they — the scouts’ motto of standing for truth and honour, decency and the Baden Powell way, etc. Instead — well, I’d better not say what they remind me of. And not a lesson will be learned, I dare say. I’m going to upload this first bit and finish it and day 10 tomorrow night :) see you just after 8 at courtroom 17! Lol to the friendly banter, too! WOW,WOW and WOW, what a brilliant job LJC !!! LOVE YOUR WORK !!! My question is about what Allison was wearing, if she was in her pajamas and if he allegedly murdered her during the night did he then dress her in her walking clothes after the evnt? And if so how awful! According to the children she was in her pajamas but she was found in walking gear. It hasn’t been established adequately how she got into that walking gear. But this morning’s evidence quite telling….!! Lots of DNA and car photos. Will keep you updated. I guess the reasonable conclusion is that she put it on….to go for a walk. Singlet top,,,,3/4 pants….white joggers laced up….short sports socks….and the jumper. If someone wanted to dress her…as if she was going for a walk, why put the jumper on her?